This interview appeared in the Spring 2014 issue (vol.2, issue.2) of Crit. Max Haiven is an assistant professor in the Division of Art History and Critical Studies at NSCAD University. In a previously unpublished interview conducted in October 2013, Haiven corresponds with IMPAKT Festival (Utrecht, Netherlands) about his multifaceted research, teaching, collection, exhibition, event and publishing project about the cultural dimensions of finance capitalism and the radical imagination. More information can be found at ReImaginingMoney.net. 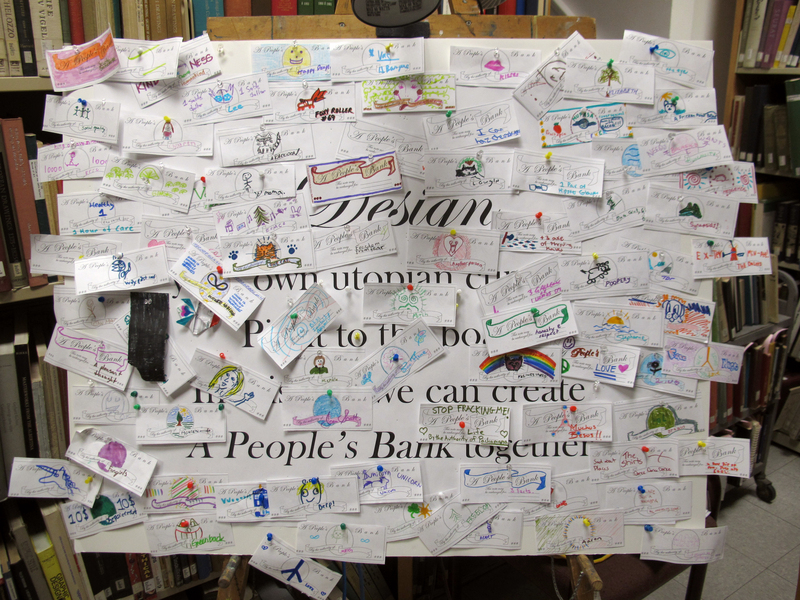 What is your ReImagining Money project about? It’s a project through which I’m seeking to explore three things at once. First, I’m trying to track and interpret visual art that uses money (coins, bills, banknotes, credit cards, etc.) as a medium or that comments or represents money through other media. Second, the project is part of efforts to unpack the changing influence of money over art (especially contemporary visual art) and aesthetic politics at a moment profound global crisis. Finally, it’s a more theoretical exploration of the idea of money as a form of representation, and of art as a unique but revealing commodity in our age of “cognitive” or “communicative” capitalism, when creativity is marketized as never before. The project has a few components. I have started “collecting” art that mobilizes money as a medium or theme on a Tumblr site (moneyandart.tumblr.com) and I think there are now over 350 examples, most from different artists. I teach a course on the topic at the Nova Scotia College of Art and Design, where I work. 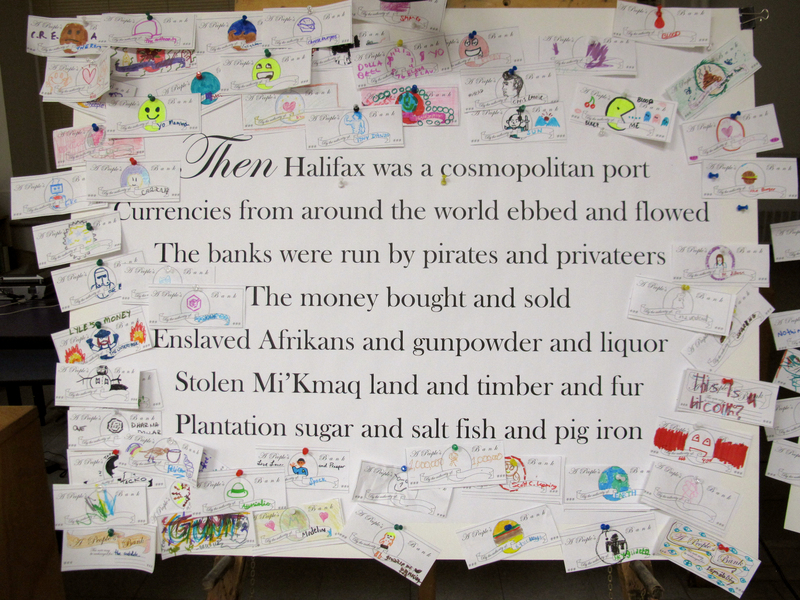 And last fall I curated a space called A People’s Bank in Halifax (Canada) for Nocturne, the city’s annual all-night arts festival. I also am writing some academic and some non-academic essays on this topic, and I’m bringing together some collaborators to do an edited book in a few years, which will include both critical essays and reproductions of artwork. What inspired you to do this project? Why do you think this topic is relevant? For a few years I’ve been researching the cultural dimensions of finance capital, both in terms of the cultural norms, behaviours, and beliefs that make the financial industry “tick” and also in terms of the way finance influences culture more broadly concerning art, popular culture and everyday life. I became increasingly interested in two things. First, the way the value of financial assets like “collateralized debt obligations” and derivatives contracts are essentially conspiracies of belief. After all, even though they make up a huge percentage of the volume of global wealth, financial assets like these are, for all intents and purposes, made up out of thin air and their value only exists so long as there is a buyer who believes in it. Second and related, I was interested in whether there might be some merit in understanding these financial assets as techniques of representation, as aesthetic practices. Stock and bonds allegedly represent some underlying real-world economic reality, but there is a sort of suspension of disbelief at work that pervades the financial markets which I find fascinating and terrifying. What real wealth does a credit-default swap represent? So I asked myself: where else can we find a sphere of activity where largely arbitrary value is assigned to largely immaterial things and sustained by a culture of belief and credibility, but which has ramifications that resonate throughout society and culture? Art seems to be the place. After all, pieties aside, in an age of postmodern dematerialized art practice, when we have abandoned any “metanarrative” by which to judge art’s “true” value, the value (especially the economic value) of a work of art is essentially a conspiracy of belief too. So, with this hypothesis in mind, I went out looking for the most tactile trace of this overlap between art and finance and I discovered that hundreds, maybe thousands of artists are using money as media. Most of that art is bad, lazy and boring. But some of it is tremendously moving, aesthetically, intellectually and politically. I think the topic is extremely relevant to most people today, not only those interested in my particular hobbyhorses. Largely, I think this is because it ties together what most people consider opposites. Most of us experience money as an oppressive, disciplinary force – we feel like we never have enough of it and the lack of it forces us to work at jobs we don’t like or go without the things we deserve. Many of us are in tremendous debt, which is extremely stressful and depressing. For some of us, lack of money means we can’t eat or afford medical services or adequate housing. Conversely, for those outside the art world’s closed circle of cynicism, art still represents the ideals of freedom, creativity, passion and imagination that we feel are lacking in our monetized lives. So on one level, I think this explains the appeal of the project. To that we can add that, today, art, creativity, imagination and passion are being “put to work” as never before. In a post-Fordist global economy, we’re increasingly experiencing precarious employment and competition for jobs, as well as cuts to government-provided forms of social care, from education to pensions to employment insurance. The result is that we have all had to become a lot more creative and imaginative about our daily economic survival, and the global economy depends on this claustrophobic ingenuity. And I should say that the research shows the impacts and costs are higher for women. Meanwhile, there is also a growing tendency for employers to demand not only the bodies and time of their employees, but also their imagination, emotional labour and creative impulses. There is something about the everyday “arts of the self” that has been commercialized and enclosed. So I think the tensions and contradictions that the topic of “art and money” brings up are very salient. You talk a lot about the “financialization” of culture and society. What exactly does that mean? There are various ways of talking about financialization and I think it’s important to keep them all in mind and observe the overlap between them and the bigger picture. The first is an economic transformation where a larger and larger share of economies in the imperialist countries (i.e. the “developed world”) is taken up by the financial “industry”, which includes investment banks, hedge-funds, credit-card issuers, real-estate speculators, insurance companies and the like. The most profitable sector of the capitalist economy has become finance, and its power has grown and grown. This power, in turn, leads to the “financialization” of both the private and public sectors. Corporations increasingly obey the dictates of “the market” to increase quarterly share prices by outsourcing and offshoring, cutting jobs, screwing workers and otherwise being austere, which is good in a short-term sense for investors but is often very bad for workers, communities, and even for the companies themselves in the long-run. Likewise, governments everywhere are increasingly indebted to or dependent on financial markets, leading to a situation where bond-rating agencies are essentially the “unacknowledged legislators” of the world (as Shelley once said of poets). To this we can add the way that, thanks to declining wages, increased user fees on formerly public services, and the growth in precarious employment, we now have epidemic levels of personal debt in most of the “developed” world. So financialization is the overlap of the economic, the political, the social and the cultural dimensions of a global economy increasingly based on financial speculation. It’s a frightening process because, just as with the financial sector itself, each individual action may seem, in its limited context, highly rational. Yet the sum of its parts is an incredibly volatile and irrational system. A system that is destroying our lives and the earth. How have people responded to your project so far? Generally very well. Money is very unique. Our current moment is one in which money is more powerful than ever. It is perhaps the most powerful force that has ever existed on this poor planet, in terms of what it can drive people to do, especially when those people are organized into corporations or other economic entities. Yet for all that power, money is still an intimate part of our daily lives. We use it to buy gifts for one another, to buy what we need and want. We carry it around with us all the time. So I think this almost magical quality of money means that art about money and theory about money are very appealing. It’s like a knot we can’t quite untangle, an itch we can’t quite scratch. I think the easy thing is for people to blame money itself. I don’t believe that money is “just a tool” that is somehow neutral; it’s more accurate to say that money transforms us into its tools. In any case, we need to understand money, in its current form at least, as an inseparable element of the global capitalist system. I try in my work to remind people of this, but it’s much easier to believe that “money is the root of all evil” and blame “greed” for our woes. But the irony is, very few of the people today who are doing terrible things (say, gambling on corn or wheat futures, trying to make a dollar off of moment-to-moment global price differentials which, in consequence, helps drive the price of these basic staples out of reach of the world’s poor) are personally evil, or, in fact, especially greedy. Practically everyone feels like they’re caught up in a system that no one really controls. They do what they think they must because if they don’t they feel like they will lose their jobs or their houses or their sense of self-worth. It is a tragedy: a completely inhumane system being run by the most human of concerns. This is the rule of money under capitalism – it disciplines us and rewards us for reproducing its authority. All that said, I think we do need to blame those who are responsible: the global economic and political elite need to be held to account and their power and wealth needs to be seized. They, as individuals, are entirely replaceable – they are merely servants of the economic system, and it is their fear of replacement that drives CEOs and others to act with such ruthlessness in their positions. But the corporate and political structures that elevate them to these positions need to be dismantled and both economics and politics need to be rebuilt at the grassroots. Do you think Capitalism is doomed to fail? If so, what would be better, alternative economic systems (if there are any)? Well, sort of. I think capitalism is doomed to succumb to its own contradictions on a whole variety of levels. But I think that if capitalist history has taught us anything it’s that those contradictions, while they might lead to terrible crisis after terrible crisis, do not mean the system is a failure. It keeps going. It does so by externalizing the crisis onto others. So for instance, in 2007/8 we had a massive financial meltdown caused by contradictions inherent to capitalism. For students of history, this crisis was unsurprising and so too was the way the crisis was displaced onto the public, first through massive handouts to the financial industry, next through the imposition of austerity (which is really just the cruel medicine once reserved for the Third World being applied now in the First). So capitalism succeeds in constantly failing, by displacing that failure onto whomever it can. I would even say that fascism is a form of displacement for these crises: at times when capitalism can no longer afford democracy, it very quickly slides into authoritarian rule. The recent rise in racism, nationalism, xenophobia and fundamentalism can be seen, in part, as an indication of the way economic insecurity caused by the displacement of the capitalist crisis is further displaced into fascistic anger. More generally, I think capitalism is a failed paradigm of human cooperation. One hundred and fifty years of industrial, colonialist capitalism have led to a massive ecological crisis, and most of us today work unrewarding, precarious jobs and can’t make ends meet. But, again, that failure is displaced onto individuals, onto the earth, onto the world’s poor who will suffer the worst effects of global warming. Since the 2007 crisis, the gap between the rich and poor has widened nearly everywhere. In terms of a better system, I think we are already experiencing it, in part. Those things that really matter to us, things like family, friendship, the natural world, romance, play and art are produced not by the market but by our common energies. Capitalism lives only by developing new ways to commodify these things and sell them back to us, but to a very real extent we enjoy and reproduce life in spite of capitalism. The question is how to make these human values rule, rather than allow them to be overtaken by capital’s pathological and inhuman drive to render all social values subordinate to money? I think that process begins with creating alternative structures for living and working together outside of – or in resistance to – capitalism. These are things like artist-run centres, worker and housing cooperatives, community gardens, common child-care and elder-care centres and so on. But I also believe that these grassroots initiatives need to be supported by some sort of more centralized organization, so I still see some role for mass politics. And I also think that the degree of capitalist power now existing in the world is such that a lot of wealth needs to be reclaimed and redistributed. It won’t be enough to simply let all the billionaires and corporations keep their ill-begotten wealth and power and just do our own thing; there needs to be some sort of overarching paradigm or organization to help redistribute and recalibrate the world’s value. for wasting our bodies and time.